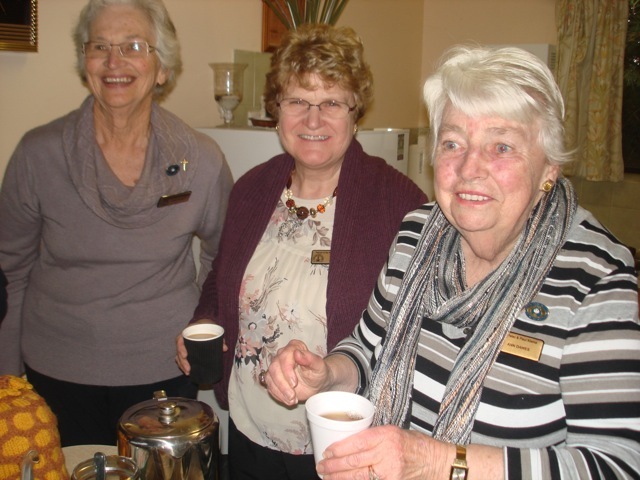 Unanderra Catholic Women’s League celebrated their 11th Anniversary in style this year by holding a “Regal Afternoon Tea ” on Saturday 28th July. Adjoining branches Dapto, Port Kembla and West Wollongong, as well as Diocesan President Sue Freestone were invited to join members and parishioners to celebrate in style. 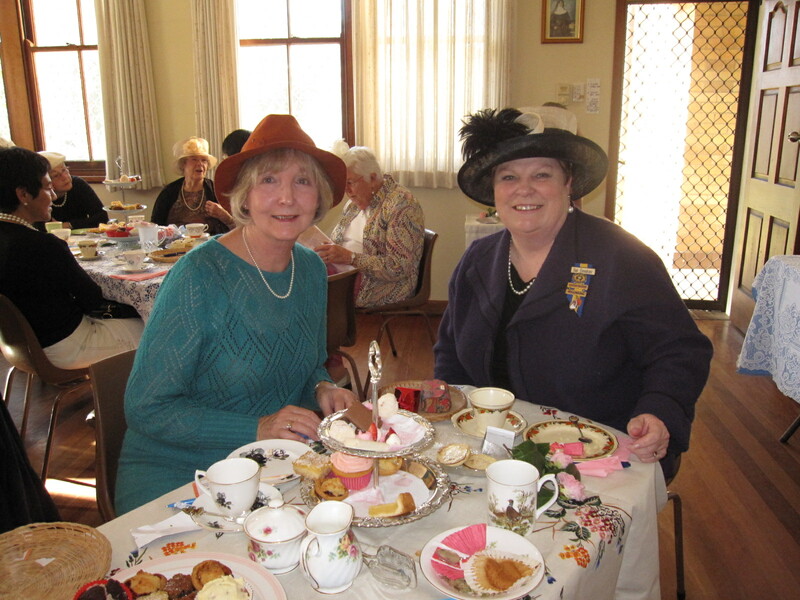 Hats,gloves and pearls were the order of the day as well as lace tablecloths and fine china cups and saucers. Members excelled in the catering department with ribbon sandwiches, creative cupcakes, slices and of course, scones with jam and cream! 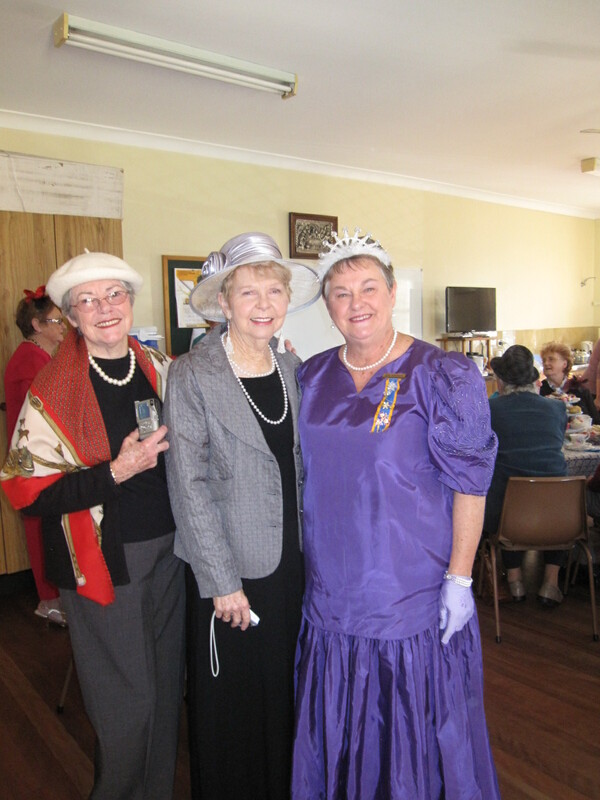 Everyone dressed up but member Sue Meehan excelled in royal attire complete with tiara and ‘royal jewels”. Parish Priest Father Mark Okeefe joined in the festivities appearing in a court jester hat from Venice. As it is the Queen’s 60th Jubilee guests were asked to mention any memories they had of the Queen and Royal Visit to Australia. Her visits to Wagga Wagga, West Wollongong, Portland, Blue Mountains were highlighted as well as photos shown. The meeting room at the rear of Immaculate Conception Church Unanderra has never looked so glamorous and a fun afternoon was enjoyed by all present. Funds raised from the afternoon will go towards the Sisters of St Joseph work in East Timor. On Thursday 7th June CWL members and friends of Holy Spiritr Vincentia held their annual “remembering -friends” day. It is a day where we pause, reflect and pray for those who have died, particularly our past members and our nearest and dearest. After the reflectrion was read, we all sang the hymn “The Prayer of Saint Francis”. Pick a box was then commenced and there were 12 options for the winners to pick prizes. The prizes were generously donated by various supporters. 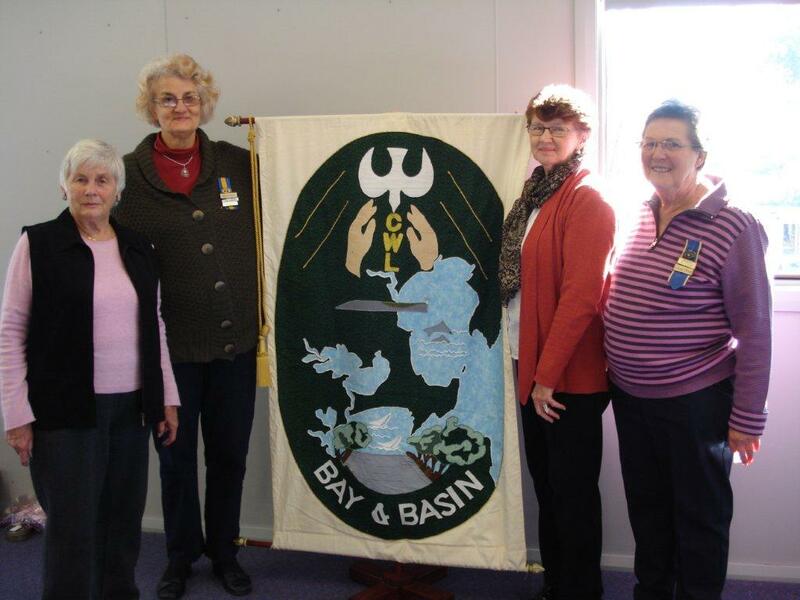 The $ 415.00 raised was donated to the Bay and Basin Cancer Support Group. 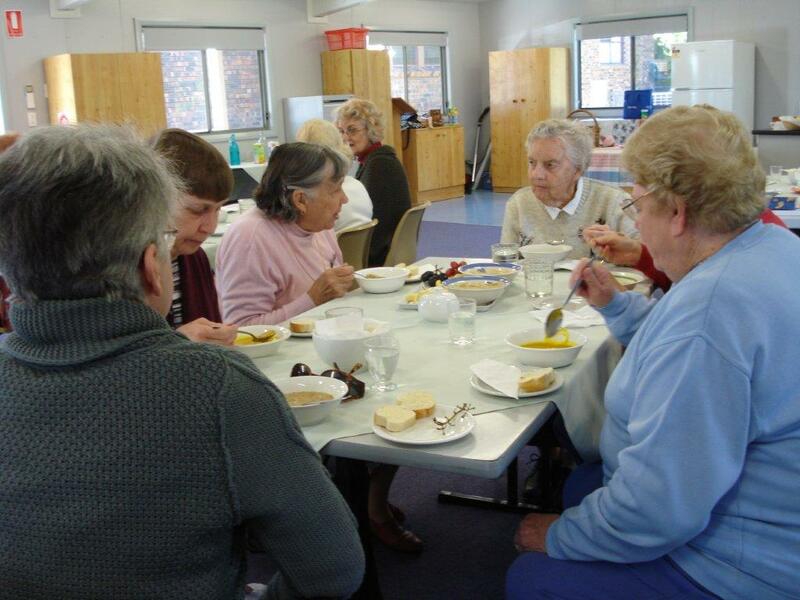 Members and friends enjoyed the lunch of hot soup with crusty bread followed by coffee and delicious slices. Thank you to members and friends for your generosity and sharing a wonderful day. Under the guidance of Father Patrick Vaughan, Diocesan Chaplain, over 70 members gathered at Gerringong for a retreat day based on Women of the Gospel: Martha and Mary and Sitting at the Feet of Jesus. During the day we were encouraged to reflect upon which woman was representative of ourselves. There was personal prayer time in the church grounds, the Rosary and Adoration of the Blessed Sacrament. Thank you Fr. Patrick for the preparation and presentation of such a wonderful, prayerful and reflective day which was valued by those present. 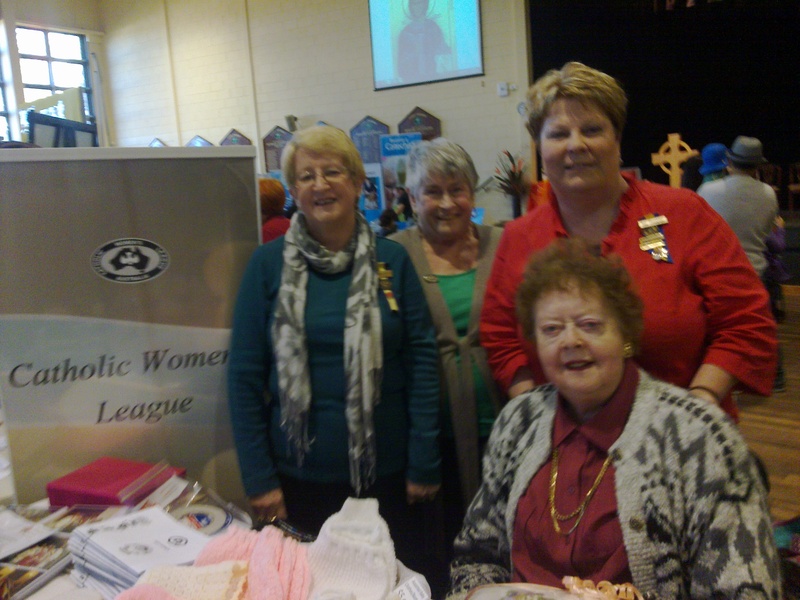 On a cold, windy day our members travelled from Branches all over the Diocese to be a part of this event and promote the work of Catholic Women’s league. 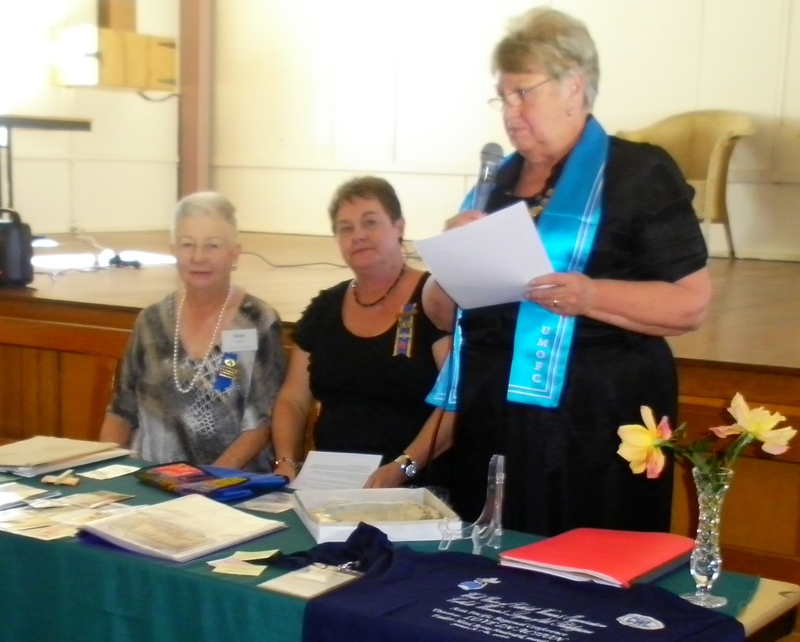 We gave out pamphlets and bookmarks, we sold items produced by members and raffle tickets fdor the New South Wales Biennial Conference to be held in September. Well done Catholic Women’s League Diocese of Wollongong. On Friday 11th May 2012 the Catholic Women’s League Diocese of Wollongong held the WUCWO Mass at St Patrick’s Church Port Kembla. The Mass was celebrated by Father Patreick Vaughan, the CWL Diocesan Chaplain. The event was organised by Mrs Mary Smith, Diocesan International Secretary. 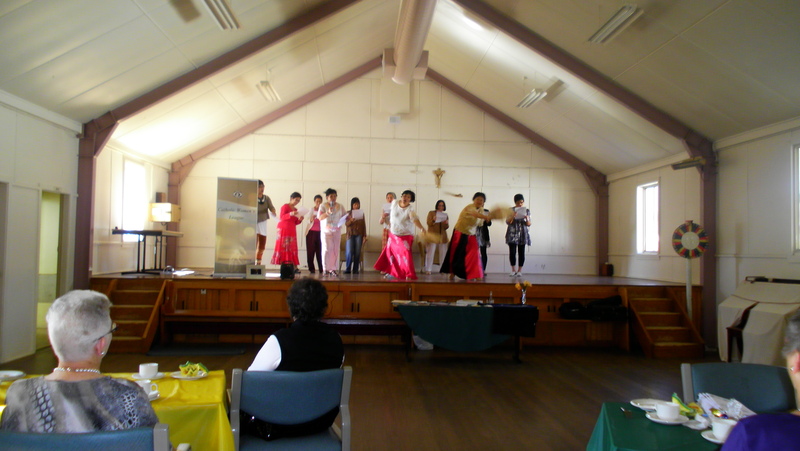 After Mass the ladies adjourned to the Parish Hall for lunch and entertainment. The following is Mary’s report of the WUCWO Asia Pacific Regional Conference which she attended with Catherine McGrath and Sue Meehan. The Theme of the Conference was “Love in Action” – Education for Women. There were nine delegates from Australia, six from Korea, three from Indonesa, two from Tonga, one each fromJapan and many from the Philippines. We were all made to feel very welcome. We were the largest group from overseas and I do not know if it was because Australia begins with A or the table we sat at for all sessions was right at the front or we were just more obvious than others but we seemed to be in the thick of it all. Catherine who is the WUCWO Board member for Australia seemed often to be asked to introduce speakers, thank speakers etc. She did a great job. I would like to comment on the sessions on Ecological Stewardship by Jane Munro, National International Secretary, CWL, ustralia. Jane explained that environmental scxience is not her field of expertise, but Ecology of Humans is. She spoke about the need for good stewardship, to see humanity as the apex of creation and that care for the planet can never be at the expense of people. At the workshop on ecological stewardship one of the points of discussion was population growth – we were advised that suggestions are being made on limiting the world’s population which are quite frightening, that we need to be vigilant, to be pro-life, opposed to euthanasia etc, both in Australia and overseas. The final session that day was on Lectio Divina given by Mrs Grace Madamba-Padilla. I was tired, almost exhausted by the time it started but it proved refreshing and spiritually illuminating and uplifting. Mrs Madamba-Padilla was on a different spiritual level to me but helped me work my way through the exercise to come to a better understanding of my relationship with God. An important part of the conference was the opportunity of getting to know other deldgates both from Australia and overseas, the chance to listen to their viewpoints, to appreciate the different cultures and know we are all striving for the same ends. The President General of WUCWO – Maria Giovanna Ruggieri attended all sessions and activities. She is a gracious , intelligent woman totally committed to the aims of WUCWO and the needs of women. She stressed that we need to be informewd, to be aware of the Church’s teachings ands doctrines. That we are called to a commitment to Justice and Love. That justice is not enough on its own – it needs love. Traffic in Manilla was chaotic, we were often late gerttring to activities outside the hotel but this was not a problem. A different concept of time!! Limousine taxis were designed for smaller people than us. I felt like a giant. Security in Manilla was very serious and very obvious. At our hotel and everywhere , especially at the airport when we were leaving. We were even checked to make sure we were not carrying any explosives before we could check in our bags. 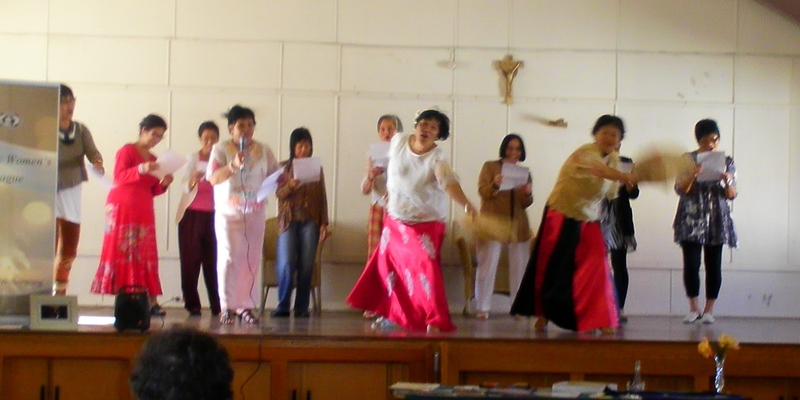 The Filipino Members of Port Kembla Branch entertained us with their traditional songs and dances. 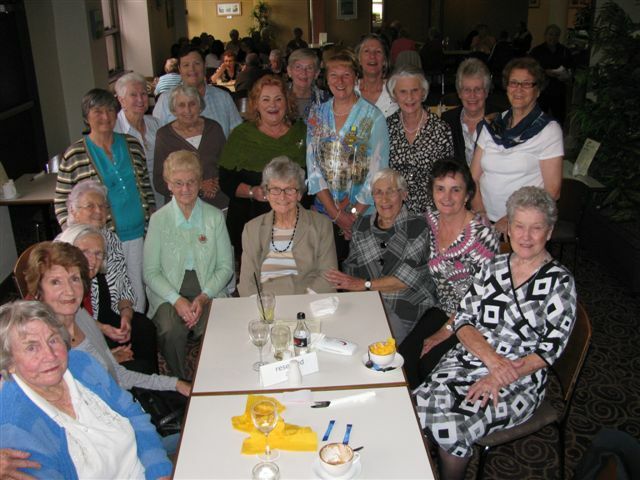 Milton/Ulladulla Catholic Women’s League gathered for lunch on Wednesday 28th March to bid farewewll to Grace Carmichael. Grace and her husband Dobbin are moving to McGregor in the ACT to be closer to their family. Grace joined the Catholic Women’s League in 1958 while she resided in Crookwell. She and Dobbin moved to Mollymook from Wollongong 25 years ago. 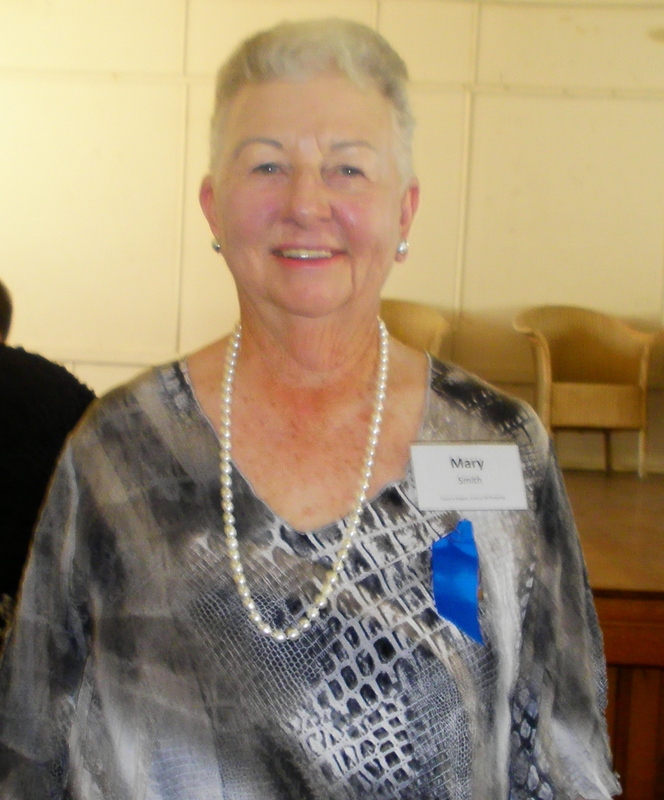 Milton/Ulladulla Catholic Women’s League was formed in 1964 and Grace has been a member since she came to the area. She was President from 1990 to 1993. Over lunch Grace and a few of the original members recalled many happy times travelling to conferences and meeting all over the country. All members of the Milton/Ulladulla Catholic Women’s League wish Grace and Dobbin well for the future. Grace will be missed. 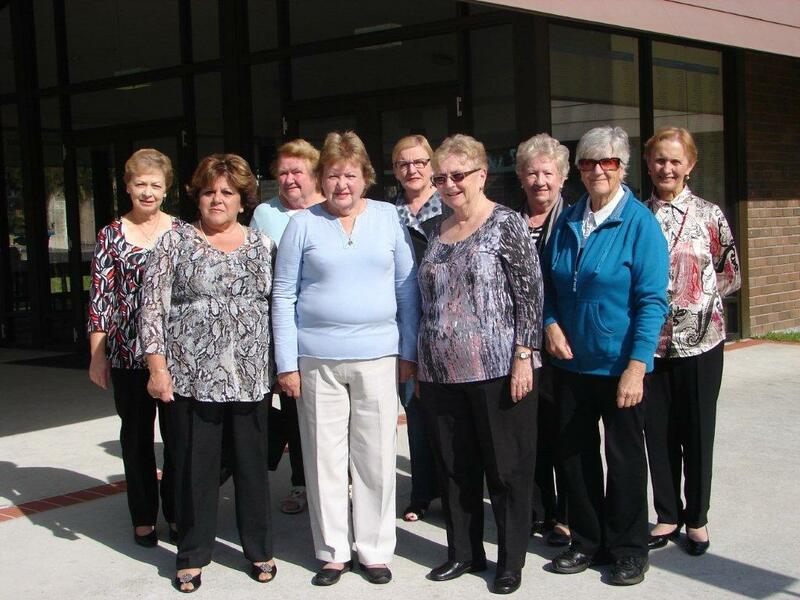 On 6th March 2012, fifteen of the sixteen current members of Catholic Women’s League Australia, Diocese of Wollongong, Campbelltrown Branch celebrated the fiftieth anniversary of the inaugrural meeting of the league held in Camlbelltown on 6th March, 1962. The League has had an unbroken presence in Campbelltown ever since this date through the devoted efforts of many past members. Seventy – four guests gathered to mark this wonderful occassion. Numbered amoung them were special guests State President, Carolyn Metcalfe; Diocesan President, Sue Freestone; Campbelltown Mayor, Cr Analouk Chanthivong; our Parish Pastor, Fr Michael Healy and Past Chaplain of the League, Rev. Christopher Sarkis. We felt gratefully honoured to note amoung our guests original members, namely, Dorothy McAuliffe (original vice – president and past diocesan and branch president over many years. ); Marjorie Ellich (past diocesan secretary and branch execxutive for a number of terms); Mary Davies (original branch treasurer) and Anne Sullivan. They certainly enjoyed each other’s company and reminiscences. Dorothy and Marjorie have an unbroken membership of our branch from 1962 till today. These two ladies together with member Roseleen Goldie have been granted Life Membership of the League. Following our Vice – President’s welcome to the celebration which took place at the Campbelltown Catholic Club, the Mayor welcomed visitors from other areas, to the City of Campbelltown and thanked the League for their contribution to the community of Campbelltown over so many years. Rev Fr Micheal Healy led us in Grace and reflected on his association with the past and present members during his two terms serving the parish of St. John the Evangelist, Campbelltown. During a delicious 2 course meal a power point presentation of photos and memorabilia helped to capture the people and activities of the past 50 years. 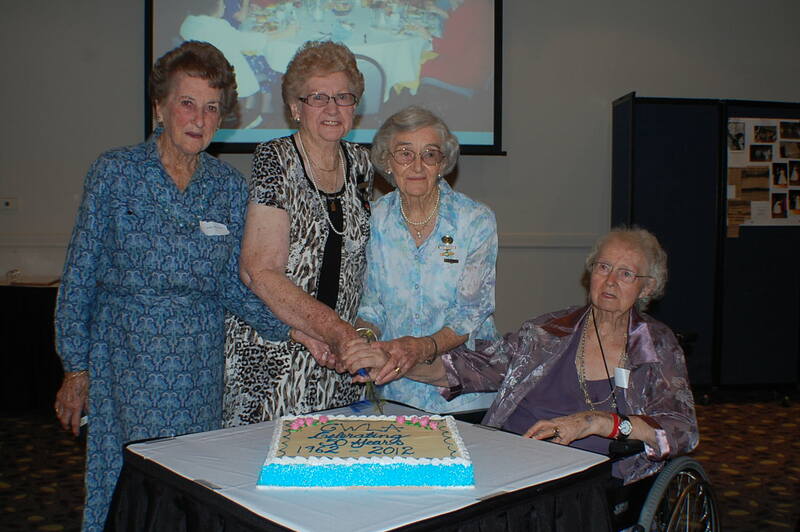 The State President proposed a toast to Catholic Women’s League, Australia and our four original members cut the celebration cake which was enjoyed with tea and coffee. Anne Sullivan, Marjorie Ellich, Dorothy McAuliffe Mary Davies. The branch members wish to thank most sincerely the Campbelltown Catholic Club and their staff members for their hospitality and generous donation to our raffle. League members from Albion Park, Bowral, Dapto, Fairy Meadow, Thirroul, West Wollongong and Wollongong branches enriched our celebration by their attendance as well as previous members from the now closed Ingleburn branch. Special thanks are due to many members for their ideas and tireless efforts to ensure the success of the celebration and to Graeme Goldie, husband of Roseleen, for sharing his power point skills with us to enhance the celebration. All present were delighted when Bishop Peter Ingham honoured us witrh a visit after attending a function elsewhere in the club. The formalities conclude with the sharing of the League’s Prayer of Dedication and everyone took home a copy of our branch history prepared by branch members. A most successful day was enjoyed by all. Report written by Norma McNally; Campbelltown branch member.